The civilization of ancient Mesopotamia is one that had significant influence on the ancient world, and the world at large. It was part of what is called the Cradle of Civilization, where some of the earliest forms of intellectual and social institutions emerged, including cities, writing systems, government and law. In this article, we will cover the period starting from Sumerian urbanization and proto-writing around 3500 BCE to the fall of Babylon in 539 BCE. The name Mesopotamia is an ancient Greek term meaning “land between rivers”, the rivers being the Euphrates and the Tigris. It was an area of the world that is now modern-day Iraq, Syria and Kuwait as well as parts of Iran and Turkey. Though not the earliest religion in the world, the religion of ancient Mesopotamia was the earliest to be recorded in writing. The two main branches of it are the Sumerian and Babylonian. This also represents the two main groups of ancient Mesopotamia—the Akkadians (consisting of the Assyrians and Babylonians) and the Sumerians. These groups were not a unified culture or nation, but a collection of city-states and small kingdoms that would intermittently belong to an empire. The Mesopotamian pantheon flaunts hundreds, if not thousands, of gods and goddesses. Some of the most important deities of ancient Mesopotamia are the Annuna (in Sumerian) or Annunaku/Annunaki (in Akkadian). The name Annuna means “princely offspring” or “sons of An” (An or Anu being the god of the sky). In the ancient Sumerian religion, the term Annuna signifies either the most important deities of the Sumerian pantheon, or the set of deities of a particular city or region, such as the Annuna of Eridu. The Annuna’s main role was to decide the fates, or act as judges in the underworld. The Annuna were not worshiped as a group, nor did they have a collective temple or iconography. Each deity had its own depictions and cult center. In daily practice, however, most people would worship the deities of their locale or those that were the patrons of their own specific tasks and needs, such as the gods of writing, brick-making and farming. The Igigi were also a group of gods that were sometimes synonymous with the Annuna, while in some myths were purported to be their servants. In the poem of Atrahasis, it states that the Igigi grew tired of the workload, rebelled against the Annunaki who were then forced to create humans to take over the work of the Igigi. 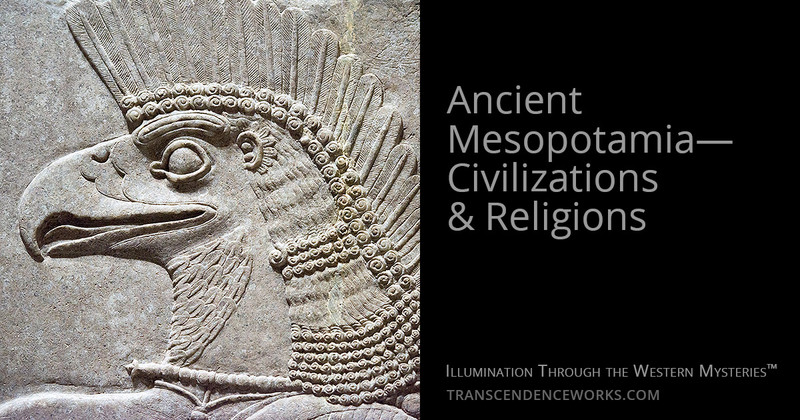 The Sumerian religion had the largest influence on ancient Mesopotamia as a whole. 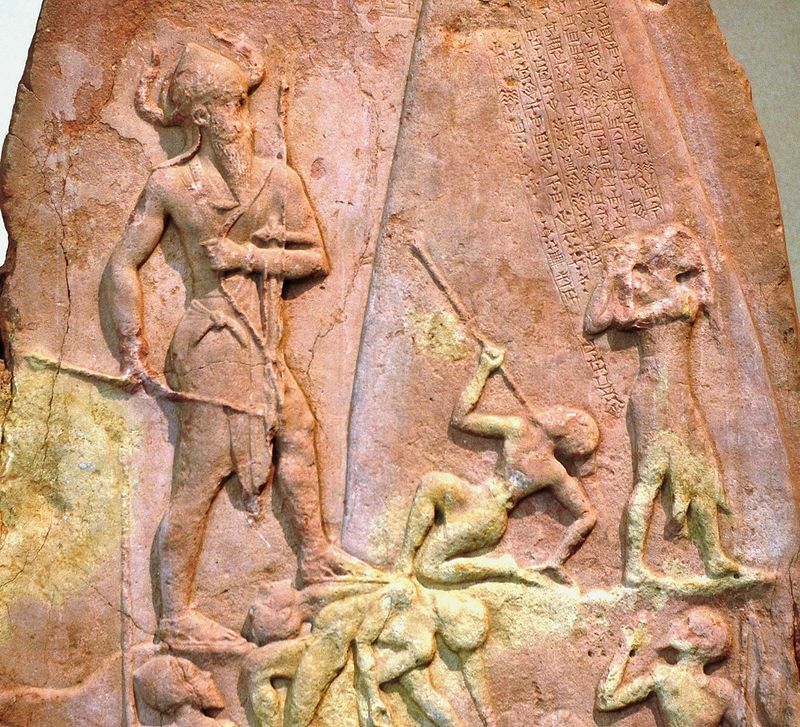 The land of Sumer, now the southern part of Iraq, is thought to have been the earliest urban civilization in ancient Mesopotamia, and perhaps also in the world. It was a collection of city-states, each ruled by a ruler, Ensi, or king, Lugal (meaning “big man”). Sumer was established sometime between 5500 BCE and 4000 BCE when nomadic tribes found wheat growing in abundance near the river. They realized that they could harvest the grain and store it for long periods of time, giving them the opportunity to settle instead of having to move constantly in search of food. The Sumerian religion was polytheistic and mostly anthropomorphic. Each deity was the guardian of a city or cities, with dedicated temples, priests and rituals. The worship of some of the more major deities was spread throughout, while the worship of minor ones was more localized. The cosmogony of ancient Sumer consisted of two main creation myths. The first comes to us from the story Enki and Ninmah. Some of the gods and goddesses of the pantheon had already existed, and the rest were created through heiros gamos, a sacred marriage of dualistic forces represented by the gods. The gods, after initial creation, began to tire of the heavy task of creating the earth and cultivating the land. Namma, the primeval mother, heard their complaints and decided to find a solution. Enki gave her instructions on how to produce human beings in order to take over the toiling and hard work. She took a piece of clay from the Abzu (the primordial sea), inserted it into her womb and then gave birth to the first humans. And, so, according to this myth, and in the religion of ancient Mesopotamia in general, humankind was created in order to serve the gods. The second myth comes from The Song of the Hoe, which states that the god Enlil separated the skies and the earth, and then created human beings. After humanity was created, the gods bestowed upon them kingship, cities, law, order, agriculture and commerce. But after a while, the gods, especially Enlil, became frustrated with humankind and decided to destroy them by sending down a great flood. Enki, as a protector, wanted to save the people from annihilation, and so he tried to persuade Enlil to change his mind. When that didn’t work, he chose a man who had been a good servant, warned him of what’s to come and instructed him on how to survive. “Tear down the house, build a ship! Give up possessions, seek thou life! Forswear belongings, keep soul alive! Aboard ship take thou the seed of all living things. And so his servant Ziusudra from the town of Eridu complied. He built the ark, took his family on it along with different species of animals. They survived and Ziusudra was then rewarded with immortality for his great work. This flood myth is from The Eridu Genesis. Ancient Sumerian temples were of great importance to the culture and daily life of the times. In a hierocentric (temple-centered) religion such as the Sumerian, temples were considered holy places and demanded certain rituals and ceremonies to ensure sanctity—such as purification before entrance. A main role of the temple was to appeal to the local god to stay there and protect and bless the city. It was believed that calamities were caused when a displeased deity abandoned the temple. Rituals and offerings, daily and on holy days, were the main form of worship. They would take care of the statue that represented the god as though they were taking care of the god him or herself. The people believed the statue to be the deity’s representation and also a possible “home” for it when it decided to “live” in a certain temple. The priesthood of Sumer was responsible for cultic rituals, divination and incantations, the first two open to both male and female priests. The head priest of a temple, the En, could be either gender, depending on the gender of the deity of the shrine. If the deity were male, the En would be female. And if the deity were female, the En would be male. At first, temples and their priests were more central and important than the ruler of the city, the Lugal. Lugals came and went, and were elected to serve for short periods of time. The temple and its priests, however, were not elected and were a permanent fixture of the city. After some time, it was apparent that this dynamic would not hold in the face of external threats or invasions. The city needed a ruler who had enough loyalty and experience to secure the city’s sovereignty. And so the Lugal went from being just a “strong man” to a king, and his importance rivaled that of the En, the priests of the temple. This shift in power would grow more and more evident until finally reaching its peak with the creation of an empire. Though the classical Sumerian civilization had already begun to decline due to the dwindling fertility of the agricultural soil, it came to a proper end with the rise of the Akkadian Empire under the rule of Sargon the Great. The Akkadians were a Semitic people—“Semitic” meaning those that speak a Semitic language, which is the original meaning of the term. Prior to Sargon, there were several attempts by other rulers to create an empire, but none lasted for long periods of time and most were subjected to numerous revolts and destabilization. In 2334 BCE, Sargon, who had usurped his predecessor’s throne and named himself king, finally managed to unite many city-states and small kingdoms under the Akkadian Empire in a sustainable way. Different peoples with different cultures, languages and religious rituals came together in one of the first melting pots of the world. He instated Akkad as the capital city, a city that has not yet been found by archeologists to this day. But in no way were the Sumerian traditions erased completely with the arrival of the Semitic armies. Many of the religious institutions, ceremonies and cults remained Sumerian. The main distinguishable feature was the changing of the names of certain deities, such as Enki to Ea, An to Anu, Annuna to Annunaki, etc. And so the religion of this empire is sometimes referred to as the Sumero-Akkadian religion. King Sargon kept the Sumerian language – an isolated language that had no relation to other languages of ancient Mesopotamia or the surrounding territories – as part of the empire and many people became bilingual. After a while, Akkadian began to replace Sumerian in everyday life, though Sumerian was kept as a sacred and scientific language until the 1st Century CE. The Akkadian Empire lasted until 2154 BCE, a little less than two centuries after its founding. It saw several kings, including two of Sargon’s sons. At the end of the Akkadian dynastic period, the empire began to collapse under the heavy weight of a changing climate, revolt from different cities and the final invasion of the mountain people, the Gutians. Gilgamesh, one-third human and two-thirds god, ruled the great city of Uruk. His strength and power were superhuman, and he used them to oppress and frighten his people. Hearing the cries and prayers of the people, Anu, the sky god, created a wild man named Enkidu, with features and powers more animal-like than human, and sent him on a mission to stop Gilgamesh. But Enkidu began to disrupt the people’s hunting and herding, so they devised a plan to distract him. They sent a temple harlot, Shamhat, to seduce him. After seven nights of sexual relations, Shamhat took Enkidu to a camp to civilize him. There, he ate human food and took on human work. One of the ways Gilgamesh had been terrorizing his people was by enforcing his “Lord’s Right” – sleeping with new brides on their wedding night. When Enkidu heard that Gilgamesh was about to do this again, he went to interfere and a fight ensued between the two. Because of his humanization, Enkidu’s original animal strength had waned and he was defeated. Still, impressed with Enkidu, Gilgamesh honored his request and they became good friends from that moment on. After a while, Gilgamesh yearned for an adventure. He came up with a plan to trek to the southern Cedar Forest to kill the demon-ogre Humbaba and cut down his trees. Though Enkidu was unsure at the beginning, he eventually agreed to go along. On their way, Gilgamesh visited his mother, the goddess Ninsun, who asked the sun-god Shamash to protect the two adventurers. During their journey, Gilgamesh had many disturbing dreams, but Enkidu interpreted them as good omens, and they continued onwards. They reached the Cedar Forest, and with the help of the god Shamash, they managed to kill Humbaba. They made a raft and traveled back to Uruk on the Euphrates, taking along beautiful cedars to make gates for the city temple. Upon returning to the city, they are attacked by the Bull of Heaven sent down by the goddess Ishtar. She had been offended by Gilgamesh’s rejection of her advances and wanted to punish him, but they managed to slay the bull. At this time, Enkidu fell ill and started having frightening dreams. After twelve days, he finally died and Gilgamesh deeply mourns his loss. Affected by the idea of death, Gilgamesh set out to find the only man who has managed to attain immortality, Utnapishtin. This perilous journey to the end of the earth was filled with obstacles, from lions and scorpions, to the land of night and the sea of death. When he finally emerged on the opposite side, Gilgamesh found himself in the paradise of the gods and saw the ferryboat that would take him to his final destination. But in a strange fit of rage and confusion, Gilgamesh killed the two stone creatures that were the only ones capable of touching the waters of death that he had to cross. The old ferryman Urshanabi instructs Gilgamesh to cut down trees to make a thousand oars, as each one would dissolve in the water and a fresh one had to be used. When Gilgamesh completed his task, the old man pushed the boat into the water, and they began to cross. Gilgamesh and Urshanabi reached the shore and managed to find the immortal one. Gilgamesh asks him for his secret, and Utnapishtin tells him of the story of the great flood, and how the gods rewarded him with eternal life for surviving. As a test, Utnapishtin told Gilgamesh to stay awake for seven nights, but Gilgamesh fell asleep immediately. Upon awaking several days later, Gilgamesh denied he had gone to sleep, but Utnapishtin pointed out the loaves of bread his wife had baked for each day he had slept, each one in a state of decay according to when it was baked. But Utnapishtin decides to give Gilgamesh another chance, he tells him of a plant that lies at the bottom of a sea that can bestow him with youth. So Gilgamesh set out once again on a perilous journey, back through many of the obstacles he had faced on his way over, and then went into the depths of the sea with rocks tied to his feet. He finally emerges carrying the plant. But to his great misfortune, a snake steals and eats the plant. And so Gilgamesh realizes that his dream of eternal life is now completely lost, and he starts on his way back to Uruk in defeat. It is not the fate of man to live forever, but to create things that will. The importance of this epic is that it is considered to be the earliest major work of literature to have been found until now. There are several versions, such as the Akkadian one above, and the older Sumerian poems that talk of a “Bilgamesh” and his adventures. 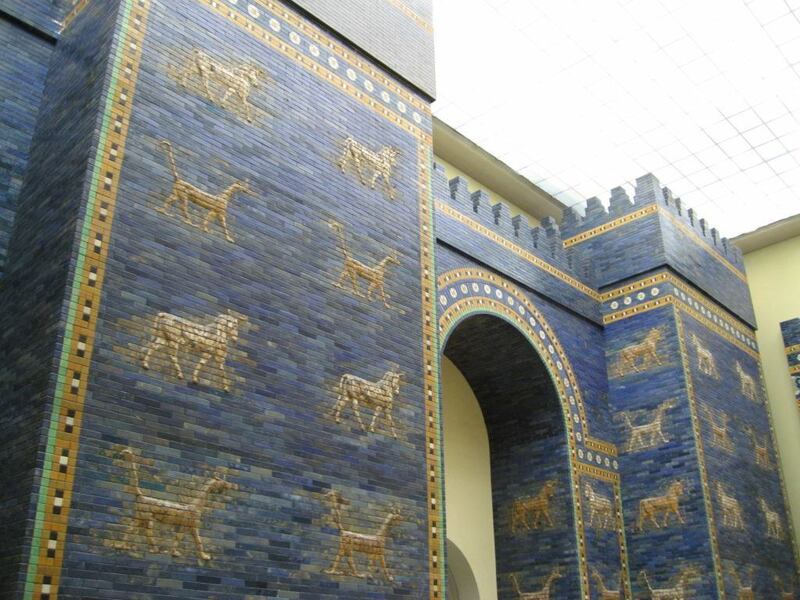 When the Akkadian Empire fell, ancient Mesopotamia was split into two main camps – the Assyrian and Babylonian. Previously part of the Akkadian Empire, and then the Third Dynasty of Ur (Neo-Sumerian Empire), the fierce warriors of Assyria managed to flourish under the reign of Ashur-uballit I (1365-1330 BCE), with Ashur as the capital city. Their power spread throughout ancient Mesopotamia, along with their reputation for bloodshed and brutality. Their conquests went from nearby Nineveh and Arbela to as far as Egypt and the edges of the Hittite Empire. They also managed to take Babylonia for a while. people stumbling over the corpses. During the height of the Assyrian Empire, especially during the Neo-Assyrian Empire (911–605 BCE), ancient Mesopotamia became another melting pot, with different peoples deported and migrated to and from the different colonized areas. Again, bilingualism and multiculturalism flourished. The Assyrian religion began to spread its influence over these conquered people through the cults of Aššur (Ashur), Ištar (Ishtar), Nabû (Nabu), Sîn (Sin) and other Assyrian gods. Ashur, the head of the Assyrian pantheon, was the patron deity of the city with the same name, which was the capital of the old Assyrian Kingdom. With the Assyrians, the temple and priesthood were not separate from kingship, and unlike the earlier Sumerians, their tradition was not hierocentric (centered around the temple). The god Ashur was considered to be the king, while the human ruler of Assyria was his steward and high priest. In the Neo-Assyrian Empire, the slight change was that the human king was considered king while still being a servant of the god Ashur. His rule was made legitimate by the authority of the god himself through the confirmation of the high priest. The rivalries between Assyria and Babylon raged for years until the Assyrian Empire collapsed under the force of two major attacks, one from Babylon and one from Medes. 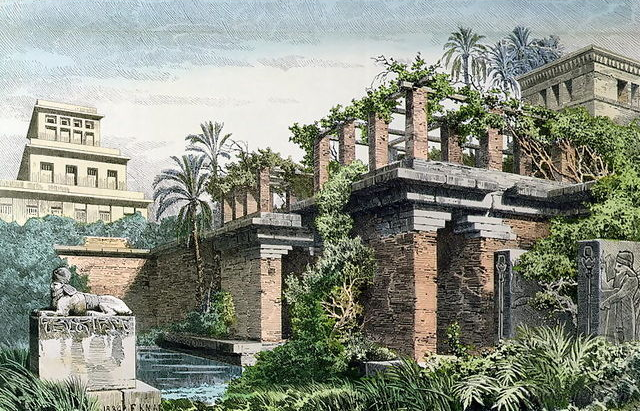 Babylon, or Babel, is perhaps the most famous city of ancient Mesopotamia – its hanging gardens, its Gates of Ishtar, its renowned riches and the mentions of it in the Bible. Though it existed during the time of the Akkadians, it came in and out of political significance and independence for many centuries until the time of Hammurabi, an Amorite king who managed to create the first Babylonian Empire during his rule between 1792 and 1750 BCE. One of the most important artifacts we have from that time is The Code of Hammurabi, an Akkadian language text written in cuneiform on a large stele and other tablets. It is made up of 282 laws dealing with crimes and their punishments based on a social grading system, from slaves to free men. 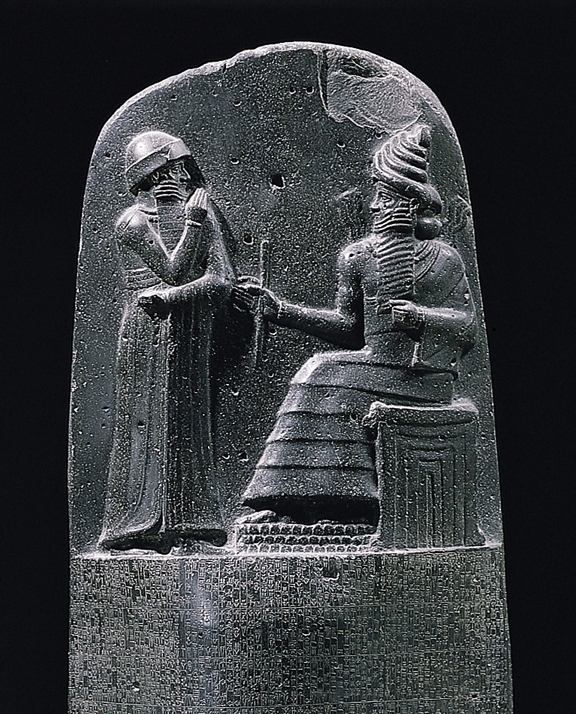 The Code of Hammurabi was comprehensive, detailing matters such as contractual agreements, payment of wages, moral conduct, and family laws such as those pertaining to marriage, divorce and inheritance. From this code we get the famous “an eye for an eye”. The other interesting aspect of this code lies in its prologue, which states that the gods Anu and Enlil decided that the god Marduk was to become the steward of all people, raising his status to that of highest in the pantheon of ancient Mesopotamia. 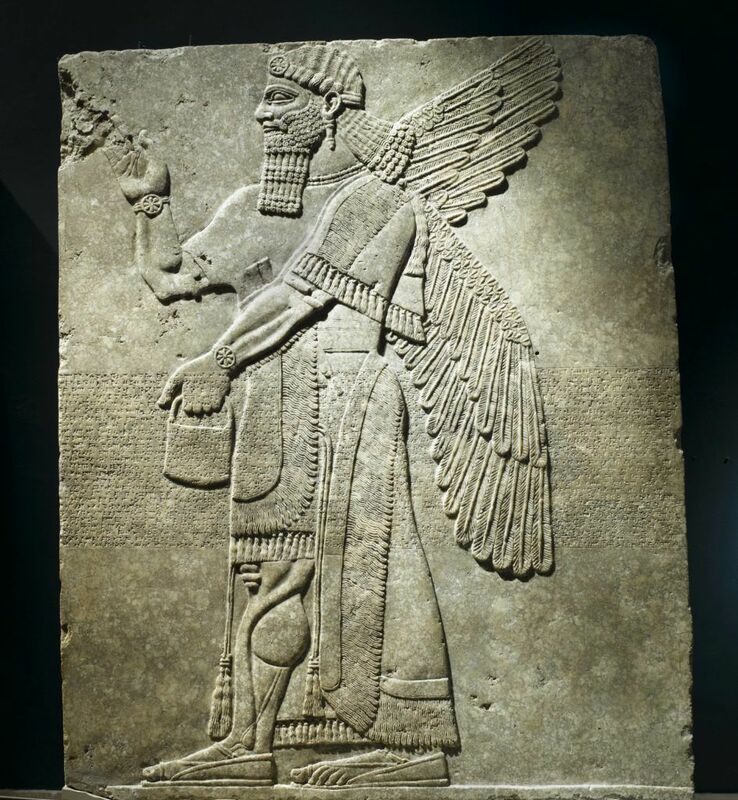 Marduk, patron god of the city of Babylon, came to prominence in the 1st Millennium BCE alongside the rise of Babylon itself as a center of power. His temple tower, or ziggurat, was what the Tower of Babel was modeled after. Marduk is the central figure in the Babylonian creation myth Enûma Eliš, or Enuma Elish. In primordial existence, when the universe was in a formless state, a god and goddess emerged. They were Apsu, the god of fresh water, and Tiamat, the goddess of salt water. In a heiros gamos, their fresh and salt waters mixed together at the mouth of the Euphrates and Tigris, forming the slime and mud deities Lahmu and Lahamu. Lahmu and Lahamu begat Anshar and Kishar, the deities of whole sky and whole earth, who in turn gave birth to Anu, the sky god, who in turn begat Ea (Enki in Sumerian), god of flowing waters. The young gods grew so noisy that Apsu, in agreement with the vizier Mummu, decided to kill them. But Tiamat, not wanting her own creations to be destroyed, warned the god Ea, who managed to overpower and kill Apsu using magic. Ea then had a child with his wife Damkina – the god Marduk, whose name means “son of the sun”. Grandfather Anu was so impressed with Marduk’s powerful appearance and the fire that comes from his mouth when he speaks that he gifted him with the four winds to play with. Disturbed by the noise that Marduk made while playing, a few gods complained to Tiamat, and convinced her to take revenge on him and the gods responsible for Apsu’s murder. So Tiamat gives birth to many monsters and appoints her new husband Kingu as the new leader. Together they begin a battle with the other gods who are not strong enough to withstand the attack. Marduk gives the gods the option of choosing him as their head in order for him to win the battle for them. The gods agree and he becomes their chief, more powerful than all the rest. Marduk manages to destroy Tiamat, tear her body in two, creating from it earth and sky. The gods that were on her side are put to work in service of the rest. They are eventually released from their burden when Marduk kills Kingu and creates humankind from his blood, who then take over the work of the gods. The fall of Babylon in 539 BCE is also the end of the Mesopotamian civilization. The Achaemenids, the first Persian Empire, conquered it and then lost it in 332 BCE to Alexander the Great. Still, the wonders of ancient Mesopotamia are alive in the many legacies it left for us – from its arts and sciences, to its calendar and laws, to other enduring testaments of its rich cultural heritage. Its stories and myths are reflected in many religious traditions to this day, and its influence on the region, and the entire world, can still be felt. The land between rivers lives on, even after the demise of its ancient and modern civilizations. And there is no doubt that it will continue to do so for millennia to come.